Whether used for parking or storage, your garage likely adds value and convenience to your life. But what must be done to maintain your aging garage for the long haul? John & Tom D’Amico of The Great Garage Company address the crowd. Nearly 50 area homeowners ventured to Cleveland Lumber Company on April 22 for LakewoodAlive’s “Knowing Your Home: Garage Repair & Replacement” workshop. 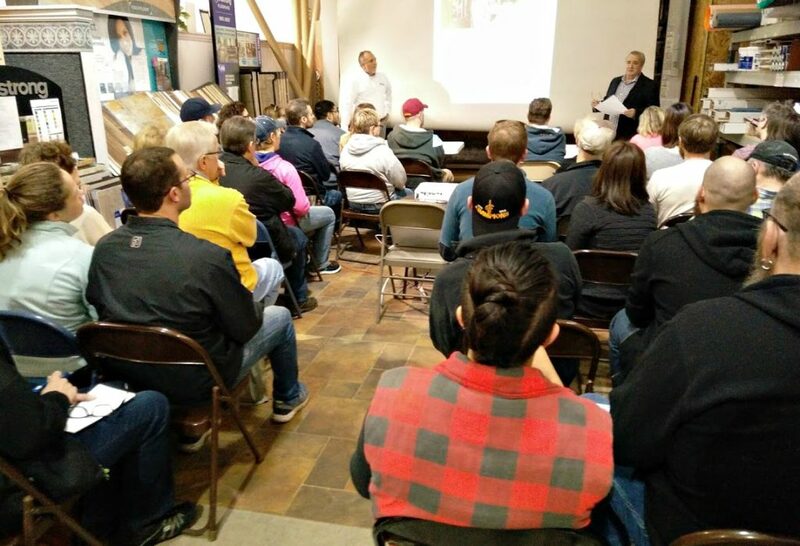 Led by John & Tom D’Amico of The Great Garage Company, this free workshop sought to provide attendees insight into determining the best course of action for refurbishing or replacing an aging garage. 1. All is not necessarily lost with a leaning garage. If your garage is suffering from a severe case of the #LakewoodLean, then a replacement might be in order. However, this course of action is not always necessary. Some leaners can be fixed by having the garage walls braced and sheathed to eliminate leaning while strengthening and reinforcing walls. It’s worthwhile to consult several trusted contractors in determining which course of action is most suitable for your garage. 2. Get your garage up to code. For Lakewood residents, chances are your home’s original garage is nearly 100 years old or more. As such, it’s important to make sure your garage is up to modern code compliance. An experienced garage repair professional can work with the City of Lakewood’s Division of Housing & Building to determine the most cost-effective ways to correct code violations pertaining to your garage. In many cases relatively simple repairs can suffice for bringing an aging garage up to code. 3. There are benefits associated with garage replacement. When a full garage replacement proves necessary, there are advantages a homeowner can enjoy with regards to both functionality and aesthetics. These benefits include increasing your home’s value, reducing your homeowners’ insurance and providing more safe storage. Ultimately, it’s important for homeowners to weigh pros and cons as they apply to their particular garage when determining whether to repair or replace an aging garage.